MTD Products of Cleveland, Ohio, is recalling about 975 SureFit blade spindle shaft/assemblies sold in the U.S. and Canada. The blade spindle shaft can break during lawn mowing and the broken blade pieces can become projectiles. This poses a risk of an impact injury to bystanders or damage to property. The company has received one report of blade spindle shaft breaking. No injuries or property damage have been reported. 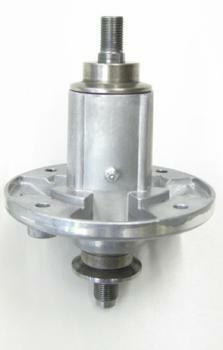 This recall involves the SureFit blade spindle shaft/assembly with model numbers 504-00341 and 504-00346. The products were sold separately as replacement blade spindle shafts/assemblies in the aftermarket for John Deere riding lawn mowers. The blade spindle shaft/assemblies, manufactured in China, were sold at Ball Equipment, Dixie Sales, Mar Brothers and other lawn and garden stores nationwide from January 2017, through September 2017, for about $58 for the assembly and $20 for the shaft. Consumers should immediately stop using riding lawn mowers with SureFit blade spindle shaft and/or assemblies and contact SureFit for instructions on receiving a free replacement blade spindle shaft. The firm is contacting all known purchasers directly. Consumers may contact SureFit toll-free at 855-971-2299 from 8 a.m. to 8 p.m. (ET) Monday through Friday, Saturday and Sunday between 9 a.m. and 8 p.m. or online at www.mtdproducts.com and click on Product Recall at the bottom of the page for more information.